Centrolina offers a chic place to dine al fresco in the alley outside the Italian market/restaurant. Photograph by Scott Suchman. Not everyone likes the brunch scene (and a scene it is). Forgo the noisy bottomless cocktail crowds and try a lovely weekend lunch instead. Chef Amy Brandwein serves Saturday lunch at her airy Italian market/restaurant in City Center. Menus change daily with whatever’s best in season. We’re always fans of her pastas, wood-roasted whole fish, and lovely, herb-heavy chicken paillard (a constant on the afternoon menu). Grab a high-top chair or one of the coveted tables at this Union Market oyster bar for some of the city’s best bivalves, divine oyster stew, and creative seasonal seafood plates. The new location at the Wharf serves a similar all-day menu with waterfront patio seating in nice weather. Chef Tarver King’s greenhouse-turned-dining room is a destination for food lovers and naturalists—a place where ingredients are both grown and foraged on the property. It’s even lovelier in the day with an a la carte menu and views of surrounding fields. The menu includes an egg or two but dishes aren’t what you’d think of as classic brunch (i.e. quail with colcannon, malt vinegar, country ham, and a fried egg). Chef Nicholas Stefanelli’s luxe Italian emporium at the Wharf serves a large daily lunch menu in the first-floor trattoria. Patrons can pick between crispy snacks like arancini and calamari, pastas, and secondi such as grilled head-on prawns (also: Stefanelli’s hay-smoked sweetbreads, a signature). Match a meal with bountiful Italian wines and cocktails. The original Shaw location dishes up a weekend lunch menu with tasty pizzas and Italian-American fare like Caesar salads, Italian hoagies, and charcuterie boards. (The new Navy Yard branch offers a brunch menu—plus prime rooftop seating overlooking the river— though there’re still more lunch-y items than not). LeDroit Park’s neighborhood cafe runs morning through late-night, with tasty Latin-influenced eats and drinks at all hours. After breakfast, the afternoon/evening menu kicks in at noon with arepas, salads, and sandwiches. Daily happy hour starts early at 3 PM (noon on Mondays). You’ll find a few brunch-y items like baked eggs on the weekend lunch menu at this cozy 14th Street Italian, but the lineup doesn’t play to the Benedict and bottomless crowd. Go heavy on vegetable small plates and split one of their gorgeous pies. The vibe is relaxed, especially on the patio in nice weather. Avant-garde fare for naturalists at Patowmack Farm. Photograph by Scott Suchman. Sushiko’s generous, bargain-friendly lunch specials are offered on the weekends. There’s a combo for $17 (appetizer and entree), or a four-course option for $30 with signatures like smoked mussel miso soup, hot rock wagyu, and sushi. Alternatively you can go all out with omakase nigiri and sashimi. 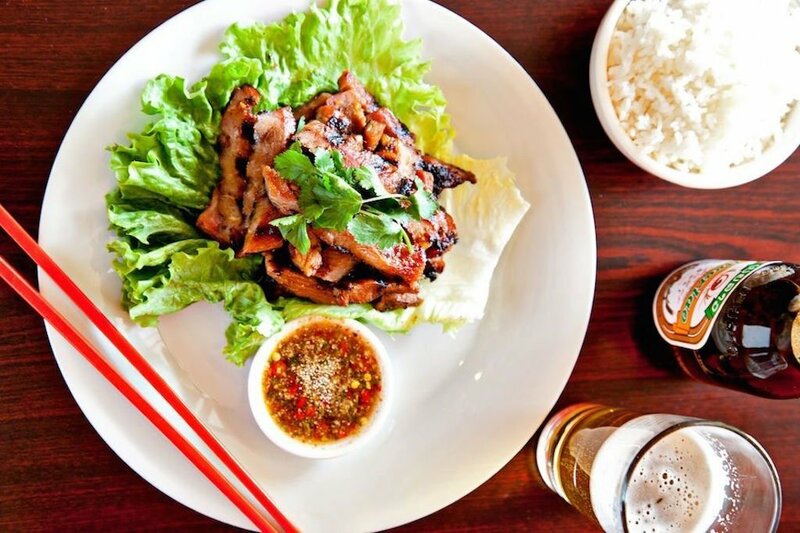 Wake up your weekend with the fiery, pungent, bright flavors of Lao cooking at these sister restaurants in Columbia Heights and Falls Church. The core menu excites—fragrant larb salads, crunchy fried catfish showered in herbs—but stay on the lookout for limited-run specials such as grilled whole fish or mee khati (coconut noodle soup). What’s more fun than gathering a bunch of friends and going for Korean barbecue on a weekend day? All-you-can-eat gets a bad rap at most places, but at this KBQ joint, it’s one of the best ways to attack the menu. For $21 at lunch get your fill of spicy pork belly, fatty brisket, and other meats grilled on the table. This atmospheric 14th Street restaurant technically serves Sunday brunch, but that just translates to a few specials like shakshuka and bloody Marys. Otherwise the place is open all day serving its regular menu of globe-trotting dishes, from tacos al pastor to curried lamb.